Televisions now come in different shapes and sizes. One of the popular shapes that you will find in almost every household is the flat screen tv. This is because prices of flat screen TVs are now within the means of even an average Nigerian. So, if you have just purchased one, one inevitable action you have to take is mounting your flat screen. On the surface, mounting a television to your wall seems like a good idea. It saves floor space and lifts the screen up to where the whole room can easily see it. There are some important things to consider, though, before you mount up. Jumia highlights some of these things. 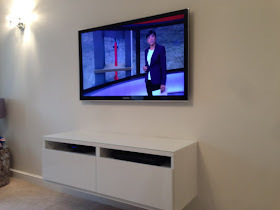 The most important thing to consider when mounting a television is whether or not your wall can hold it up. Because of this, the location you choose will need studs to anchor the screws. If your wall cannot handle it, look for a better spot. Check to see where the ports are located on your television. If the ports are on the back of the TV, you'll want to purchase a wall mount that will give you better access to the back of the television. This is particularly important if you're the type that's constantly adding new devices. You don't want to unmount the television every time you need access to the ports. Most people have several devices connected to your television. Game consoles, cable boxes, DVRs and the likes are going to need a home nearby your television so the cords will reach the TV's output ports. If you do not, you can put a bookshelf under the television to contain all of the devices. Simply drill a hole in the back of the bookshelf to thread the cords through. Some Nigerians do not bother about concealing cables. However, you know that if your cables are exposed, your home will just look haggard. Even if you don't plug a single device into your television, you will still need to contend with a cord trailing down your wall to the wall socket. Make sure you have the tools needed to mount a television on your wall. You'll need a stud finder, drill and a screwdriver. If you don't have the tools you need, then get someone who has these tools to help you mount it.